ATV Channel – Program Editor On January 31, 2008, a MiniDV format video cassette holding 35 minutes of footage was brought over to “TUBITAK” The Science and Technology Research Board of Turkey’s (a Scientific Institution owned by the state that is highly reliable and influential) National Observatory (TUG) by Mr.Tolga Ozdeniz, the Editor of “Reporter” that has been aired on ATV Channel. The footage on the cassette was said to have been recorded by a Canon GL1 MiniDV digital camera on a beach of a holiday village in Kumburgaz/Istanbul by an amateur. The images were examined by TUG- National Observatory Image Processing Unit. Because, it would take quite a long time to analyze all of the images, only randomly selected parts were pre-examined. During this process, emphasis was not placed on images produced by optical clarification effects which a number of point light sources generated. – The images were recorded in digital NTSC format by above-mentioned camera. – The date on the video indicates that the recordings were made during 2007, 2008, and 2009. 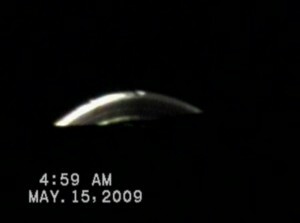 – The first observation made from the footage is that some of the images were recorded in nighttime sky at a certain altitude from the horizon. 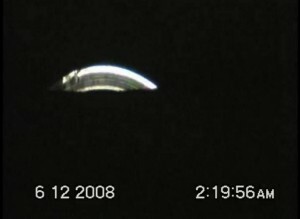 The footage also covers images of moon in some parts which proves that the video was shot in nighttime and open air. But, the fact that digital date display’s showing AM in certain frames and PM in others, raises suspicion about the validity of the time in which the recordings were made. – Since in some parts, there is no other object that can be featured as a reference in the close-up frames and no observable differences were found on background examination, the actual location, distance, dimensions and nature of the objects could not have been determined. – Through the examination of shootings of multiple dates, it’s a strong possibility that 2-3 different objects were captured. However, it’s difficult to determine whether the objects are moving or not. Their movement is slow even if they do so. – The reflections of light on the objects are sometimes caused by moon which was in a convenient location at that time, and sometimes produced by some other sources of light. – The light reflection from the left side of the object which is seen on August 10th shootings is not produced by the moon. At that time, the moon was in a phase that was pretty close to the “new moon” phase and located approximately at a 10 degrees proximity/angle to the horizon. Moreover, the image processing analysis conducted on some part of the footage revealed that the center of the object has the same density as its background, namely is of a transparent nature. In conclusion, even though a detailed analysis of the footage is conducted, it might still remain unidentified. Hence, other reference objects need to be recorded in the same frame with the disputable object and further shootings need to be done by ourselves with special equipment in the same location and conditions. 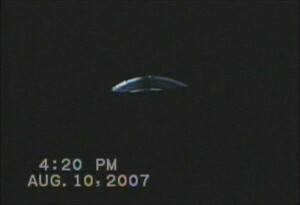 Accordingly, the term “UFO” (Unidentified Flying Object) which has been used for these sort of dubious objects can also be used for these objects. But, this definition does not mean that these objects are from extraterrestrial (flying saucer etc.) origin.